Following the success of the Jim Carrey comedy Ace Ventura: Pet Detective in 1994, it was perhaps inevitable that a sequel would follow and indeed it did in 1995, with the release of Ace Ventura: When Nature Calls . Although largely maligned by critics at the time, the film made over $200 million against its $30 million budget, and was a financial success for Warner Bros. 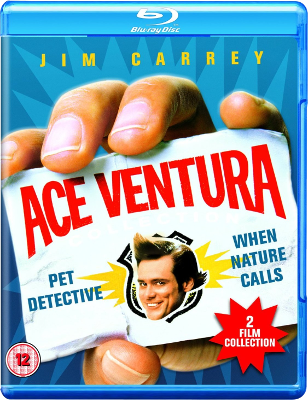 Ace Ventura: Pet Detective had been passed uncut with a 12 rating for a British theatrical release in March 1994, and this rating has been retained for all subsequent home video releases since. 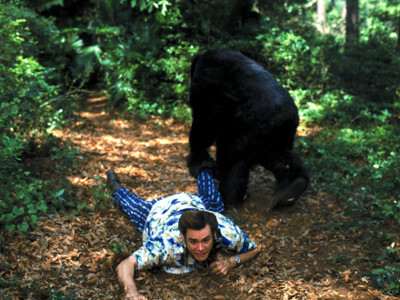 In late 1995, Warner Bros. submitted Ace Ventura: When Nature Calls to the BBFC for a theatrical rating with a request for a PG certificate; perhaps, in part, due to the fact that some children under 12 had seen the first film on video and TV and enjoyed the madcap antics of the Ace Ventura character. 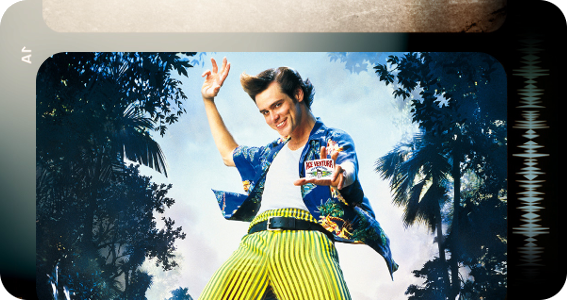 Ace Ventura: When Nature Calls had received a PG-13 rating in the United States for "crude humour", and it was this version of the film that came in to the BBFC with a request for a PG. However, the Board were adamant that heavy cuts were required to bring the film in line with the family-friendly parameters of the British PG rating. In this edition of Cutting Edge, we'll be taking a look at the changes that were demanded of the film by the BBFC in order to achieve a PG rating. When Ace attempts to rescue racoon, considerably reduce close shots of animal whimpering and clinging to Ace before falling to its death (not funny to young children). During slide show, remove all sight of shadow hand over man's crotch. In order to accommodate this somewhat unusual request whilst maintaining continuity, the filmmakers made use of some alternate footage, which simply shows Ace's two hands fighting between themselves. Remove Ace's dialogue to native African man: 'Your balls are showing'. Reduce spitting sequence in sacred bat hut. Just under 20 seconds of footage was removed, heavily reducing Ace's snorting and the subsequent sight of everyone covered in spittle. Only a brief indication of this remains in the UK's PG version. "Remove all sight of man's shadow rocking vigorously to imply masturbation." Remove big close-up of Ace pushing his eye-ball out. As a result, the act is heavily shortened in the UK version. Remove all sight of Ace pushing pregnant woman's stomach and subsequent expulsion of foetus across hut. As a result of this change, there was a rather obvious jump in the musical soundtrack, which ends up showing Ace displaying the previously-mentioned apple core before cutting randomly to a shot of the man holding the baby below frame as he exclaims. Remove close shot of foot in Ace's crotch. All that remains of these events in the UK version is Ace falling backwards and a shot of the man standing holding the two spears aloft. In scene featuring slide presentation, remove all sight of hand shadow playing over male figure's crotch. This change was duly made, and after three seconds of cuts the film was passed PG on June 4th 1996. A few years later, the UK cinema version was submitted to the BBFC again for a home video rating, and with no further cuts required of the film it was once again passed PG on September 21st 2000. The cut UK cinema version of the film has remained the official UK version since it was first released in cinemas. UK fans wishing to get their hands on the uncut version of the film are obviously encouraged to pick up the Blu-ray set. For those wanting the uncut version on DVD, the Region 1 release in the United States was reissued on June 6th 2017 and features none of the BBFC cuts. 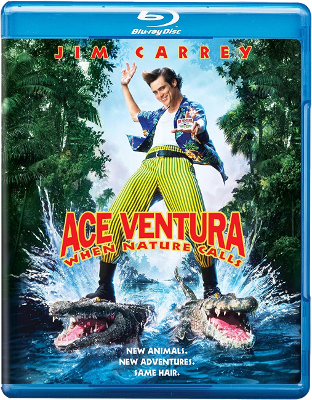 It is worth noting that Warner Bros. released Ace Ventura: When Nature Calls on its own on Region Free Blu-ray in the US in early September 2013, but this edition appears to be out of print. Fans in America wanting to own both films can also grab the UK double Blu-ray set, as this too is Region Free and will play on any Blu-ray player worldwide.